1 What is a Text Adventure? What is a Text Adventure? A Text Adventure is a type of nteractive fiction where the reader takes a more active role in the story besides just reading. A text adventure is a computer game based only on text where the player tells the computer what they want to do and the computer describes the results. Text Adventures were among the first computer games invented and became a major hit in the 1080’s. One of the first Text Adventures written was ADVENTURE in 1972. ADVENTURE was created by Will Crowther and enhanced by Don Woods. It was written on PDP-10 which only had a six-bit character storage causing the file name to be ADVENT instead of Adventure. ADVENTURE is known as the father of text adventure and many text adventures can trace its lineage back to this game. In response to this game, some students at MIT thought that they could do better and developed Dungeon in 1977. 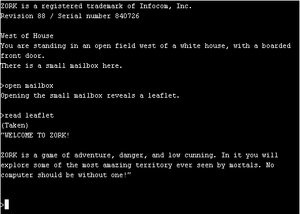 After the creation of Dungeon, which they renamed to Zork, the students formed the company Infocom Inc., and began to explore game design for home computers. Infocom found that their game was too big for the memory. This problem was solved when they split the game among three disks. In 1978 Scott Adams became a legend in the world of text adventure with his release of Adventureland, the first text adventure for the home computer. In Adventureland Scott performed amazing tricks in programming to get his game to fit in a small space. When you load up a text adventure there will be some introductory text describing the surrounding area. This text usually contains two parts; the location and a description of the surrounding area and items seen. In the description there may be some items that you can act on or you may have to come back to these items at a later time in the game to complete the action. In order to move around and complete actions the player must issue a command to the computer. Commands can be tricky since they are in a specific format that the computer can understand and you may or may not be able to perform that action. For example if you are in a forest and want to travel where there is no path the computer will respond with “You can’t go that way” or will tell you why the command cannot be executed. All of these commands are in the imperative and tell your player what to do. There are six types of commands: one-word actions; action and direct object; action, direct object and indirect object; order to another character; communicating with another character; and special commands. One word actions are command like LOOK, JUMP and do not act on an object. In an order to another character you can tell other characters to do something such as BOB, GIVE ME THE BOTTLE. Communicating with another character is similar to the third example where you can ask, tell or show other characters something. TELL BOB ABOUT THE TROLL. Special commands do something outside of the game such as SAVE, which saves the game, and RESTORE, which restores the game to a previous point. This is a list of some of the more common commands used in text adventures. There are many more commands available. This page was last modified on 11 January 2013, at 23:26. This page has been accessed 8,504 times.